Located in the Texas Hill Country, your hunt will also include lodging, guide services, and use of our walk-in-cooler. This Hunt is for a $2500 "Monster" Trophy Axis Buck. We also have Management Bucks at $700 and Trophy Bucks at $1500. This deer specie is commonly known as the most beautiful deer in the world. They are chestnut brown with white spots. They have a large white throat patch. 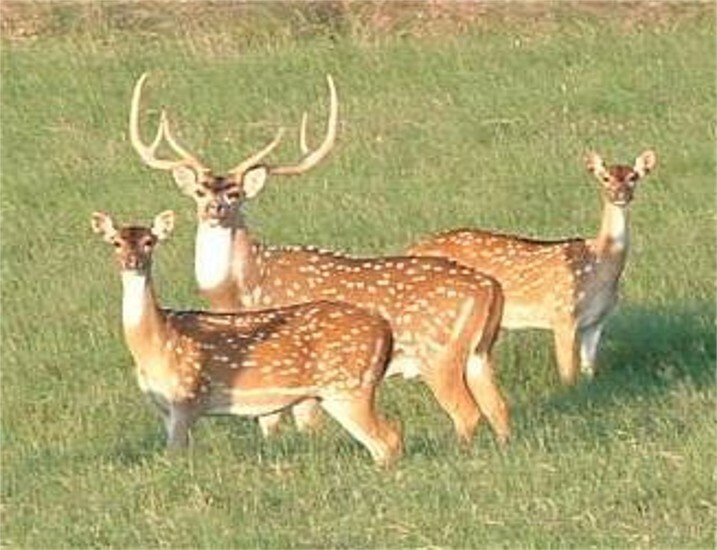 The bucks grow long antlers, usually with three points per side. A large male will weigh 250 pounds while a female will weigh 100 pounds. Being from a tropical climate with no noticeable winters, axis deer evolved to grow antlers and breed during any month of the year. Although, most Axis bucks are in hard antlers in the summer. While on this hunt you can also take other animals at addtional fees such as: Aoudad, Blackbuck Antelope, Corsican, Fallow, Ibex, Mouflon, Sika, Texas Dall, Black Hawaiian, New Zealand Mountain Goat, Merino, Painted Desert, Four Horn, Catalina, Whitetail, Hogs, Turkeys, and much, much, more! Bring the entire family and have the experience of a lifetime. We have hunts to fit every budget, from Meat Hunts to Trophy Hunts. The sizes of Trophy Axis Bucks will vary. There will be Trophy Axis Bucks larger and smaller than pictured.